The US has reportedly said to formally seek extradition of Huawei's Chief Financial Officer Meng Wanzhou. Since Meng was arrested on December 1 in Vancouver, the deadline for the US to file a formal extradition request is 30 January, 60 days after the arrest. What is the implication of Washington's move? How will it influence China-US-Canada relations? Global Times sought the opinion of two experts on the issue. As the deadline nears, Washington may be too busy coping with the shutdown chaos to consider Meng's case and make the formal extradition request. Ottawa is urging Washington to take the action. Extradition is a strict cooperative law enforcement process between two jurisdictions. The US' filing a request does not mean that Canada must immediately send Meng to the US. Canada has to conduct a judicial review procedure to weigh the request, during which Meng's appeal will also be taken into account. At least in the legal sense, if Meng's appeal is credible and convincing enough, there is a good chance that Ottawa would hesitate to transfer her to Washington. Nonetheless, it should be noted that Meng's case is political in the garb of a legal procedure. If law is the only factor to be considered, I believe Meng will win the lawsuit; but when the political factors come into play, there would be increased uncertainty. Meng's case is a long-running battle. As long as it is not resolved, it would be tough to iron out China-US-Canada relations. Washington is unwilling to see any of its allies strengthening relations with Beijing, but China-Canada ties should not be affected by the Meng incident. Canada should abandon its role as a US puppet to sully China's image. The right thing for Ottawa to do is to immediately correct the mistake. Washington tends to make important decisions at the eleventh hour. It is used to taking a wait-and-see approach toward the two or more sides of the game, and then determine what measures to take. In Meng's case, the US has its own strategic requirement. It needs to observe the interaction between China and Canada to make up its mind. If China takes a tough stance, the US would act prudently. If Canada requires support, the US will provide it. Chinese Vice Premier Liu He will visit the US on January 30 and 31 for the next round of US-China trade negotiations. The US may proceed to file a formal extradition request for Meng just days before Liu's visit as a leverage to exert pressure on Beijing to pursue its interests in the trade talks. But the US side will not bring it up during the negotiations with Beijing. According to Reuters, US President Donald Trump stated he would intervene in the Justice Department case against Meng if it is in US national security interest and US-China trade talks. His words signal that before Meng is extradited, he could apply the president's diplomatic prerogative to intervene. The US has a system of separation of powers and its judiciary branch is independent. If Meng is extradited to the US, it would be difficult for Trump to exercise his influence. 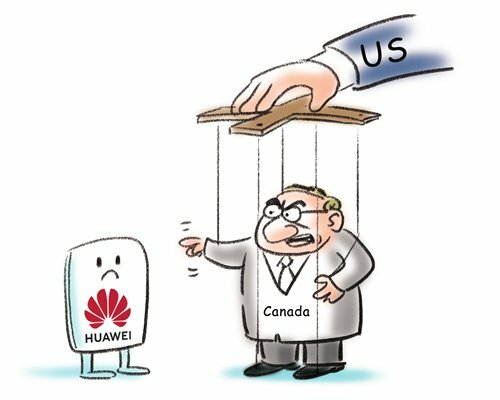 Canada claims to be a country with the rule of law, and will deal with the US request based on laws and will not hand over Meng without careful consideration. In fact, Ottawa has been disappointed with Washington, complaining that the US is competing with China at the expense of Canada. On the surface, Meng's incident is a legal issue, but politics and diplomacy play an important role.